A Pile of Holiday Cards! 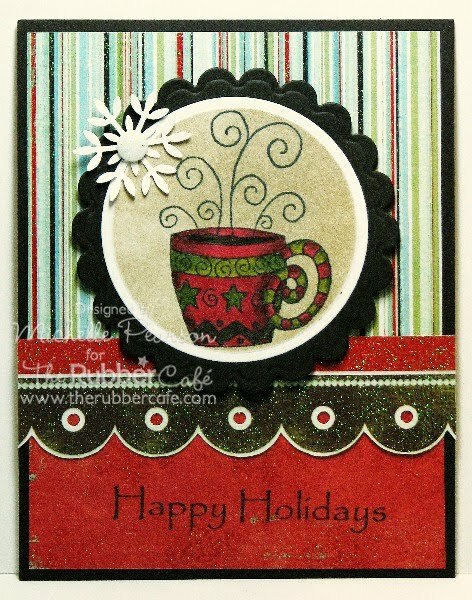 Here is a card using Curled Mug and a sentiment from Christmas Tidings. Image is colored with Copic Markers. I also have some very quick and easy cards for you today....combining some sentiment images and a pack of My Mind's Eye papers. 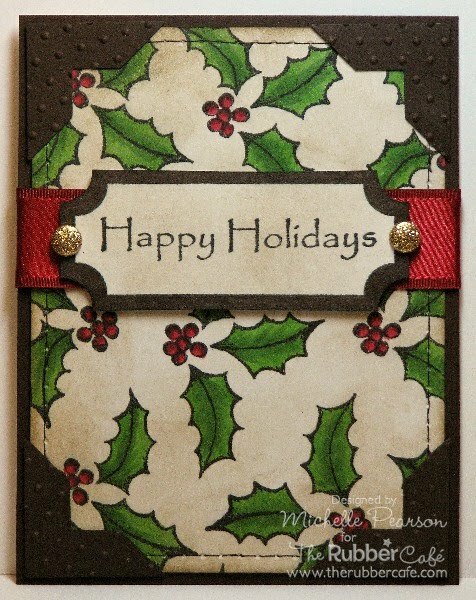 This sentiment is from the Ornamental Holiday set. HINT: Look at your papers that have borders and large designs, think how they could be used on a smaller card scale. I found ornaments in this line that were the perfect size for my sentiments!! Below are three more cards using the same idea! This sentiment is from the Christmas Tidings set. 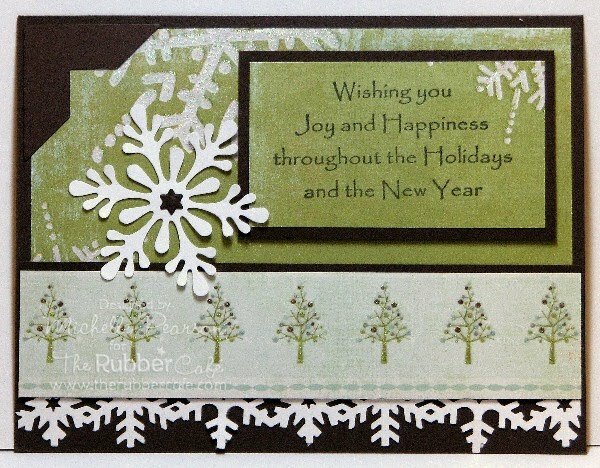 Love the shape of a long narrow card and I thought this set from The Rubber Cafe called Ornamental Holiday would be perfect for such a card. I stamped my image three times in red ink cut it out with my deckled rectangles and embellished with some pearls and pretty red bows at the top of the ornaments. Simple and elegant dont you think? I am also noticing that this set is on sale for a FABULOUS price so you must head over to The Rubber Cafe to check out the sale!!! 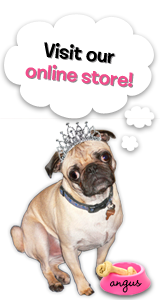 Hope you had a fantastic Thanksgiving, Black Friday, Small Business Saturday, and a fun Cyber Monday. Did I cover it all??? Amazing HUH??? Well enjoy the rest of your day!!! Just thought I'd share a couple of holiday themed tags I made tonight. I used Spellbinders Labels Eight, and stamps from Christmas Tidings, Warm Wishes, and Ornamental Holiday. I also used another empty package I had left over from another project I posted, you can view it here and some really cute mini pompom ribbon I bought at a recent Scrabooking conference that I attended with Melissa. Oh and I almost forgot those cute embellishments of jelly dots and snowflake. Remember you can create cute things but not have spend all night on them. I hope you are spending time with family and friends today and enjoying a very nice Thanksgiving. 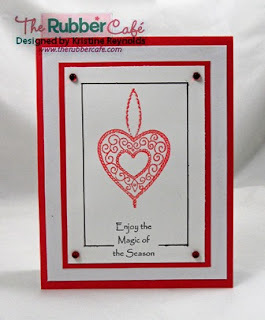 It's my day to post a project on The Rubber Cafe Design Team blog so I have a project to share with you even though I am not stamping today! It's been a while since I made a candle but I am pretty happy with the way this one turned out! You can find directions for stamping on candles here. 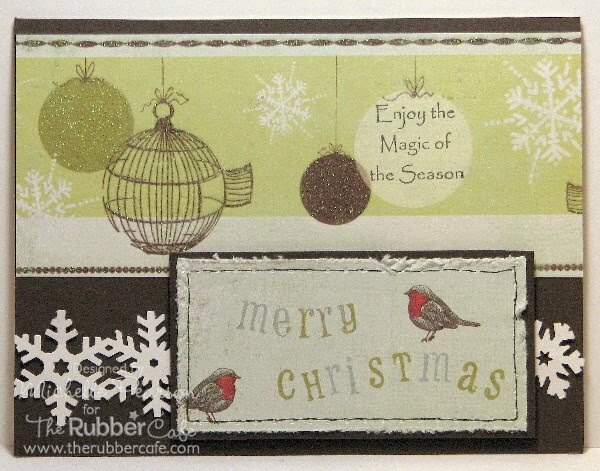 I used stamps from "Christmas Tidings" by The Rubber Cafe. Colored with Copic markers and finished it off with a little stickles for some sparkle! 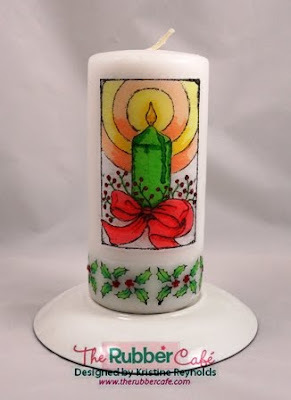 Stamping on candles is a great way to create an original and thoughtful gift for someone special! Watch the sales you can usually find candles on sale so you can always have them on hand when needed! Happy Thanksgiving Eve. While a lot of folks are getting ready for turkey day, I'm getting ready for Christmas. I love decorating the tree with handmade items and yummy gifts. This year I'm making Orna*Mints* to hang on the tree. Each one will also be labled with a little name tag so nobody can say..."hey...I didn't get one"
I started by punching a hole on the top of the die cut. Adding a piece of One and Only double sided tape on the backside of each die cut, I adheared them to either side of the candy. Don't limit yourself to pepermints...try any bite sized candy for this technique. Thread your ribbon through the holes and tie a knot in the middle. Decorate as you wish. I used Ornamental Holiday to decorate my Orna*Mints*. This is quickly becoming one of my favorite stamp sets. Happy Monday Folks! I have another Christmas card today, using the Ornamental Holiday set and some really, really red colors. I love the red, black and white color combo. Always so striking! The ornament is stamped with black Versa Fine and clear embossed before cut out. To outline the dots on the stamps I went over it with my white signo pen. I like how that part came out. Are you ready for December? It’s right around the corner, and I simply can’t believe it!!! Are you done with your Christmas cards? I still have quite a few to go! So better get going! Have a lovely new week filled with stamping! This time of year it is nice to have some little tags ready for quick gifts for those in our lives we want to show appreciation for! I came up with these really quick and simple but gorgeous tags. I used the Warm Wishes set. I love that there are different sized images and both solid and line images in this set. Happy Holidays comes in two sizes in this set...so you will always have the right sized image for your creations. For three of these cards, I embossed my images on the light green paper and then distressed them with Frayed Burlap distress ink. The embossed images show up light green and give a warm toasty feeling. 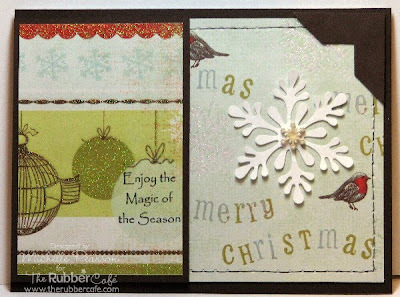 For the top right card I simply stamped my images with the Frayed Burlap ink onto the light green paper. 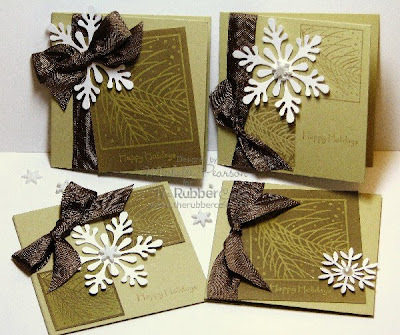 I embellished all of the cards with vintage seam binding and snowflake punches. Thes cards measure 3x3 inches. Are your Christmas Cards done? Christmas is getting closer and closer...do you have your cards done yet? Me either but I'm working on it. Here are a few more that I have made recently. They are pretty quick and easy to reproduce but look like you spent a lot of time on them! I used "Ornamental Holiday" from the Rubber Cafe for all three of these cards. This paper is by The Paper Studio from Hobby Lobby. It looks like it was made to go with this image. 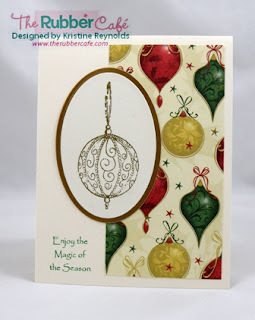 I embossed the ornament with gold EP on smooth cream cardstock and then cut with my oval nestabilities before backing with a larger gold oval. This would be a really easy card to mass produce! This next card uses another ornament from the set. I embossed the heart ornament in red. The black border was hand drawn with my black memento marker. I used Holly Berry Jelly Dots in the corners! While this is a simple card to make it does take a little longer because of all the layers. And finally, this card is my favorite of the trio. When I inked up the star ornament I didn't ink the loop on top so that just the star part would stamp. I stamped the star in green, yellow, and red. The borders on each side were punched with my Martha Stewart "Arch Lattice" border punch. And I used Jelly Dots (Holly Berry, Amber, & Green) on the bottom. This is a terrific, versitile set! 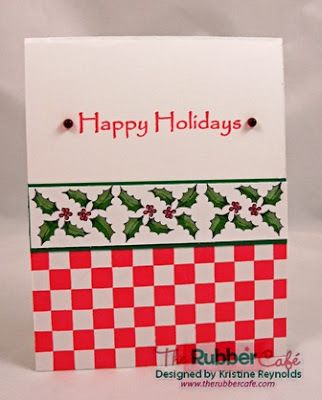 If you haven't started your Christmas cards yet, I recommend this set to help you make beautiful, easy cards! Happy Stamping! Hi! New Monday, new cards! :):):) Today I’ll give you another card with my number one favorite Christmas sentiment stamp. It’s from the Christmas Tidings set. Looooove this set!!! And isn’t this sentiment simply wonderful??? I stamped with Distress ink – Aged Mahogany and clear embossed it. I love the color of Aged Mahogany, it gives such a Christmasy look. I used the Spellbinder’s Labels Fourteen , and mounted two sizes on top of each other. Love how that came out. I wish you all a happy scrappy new week! I've had fun playing with the holly from the Christmas Tidings set. This was white cardstock that I stamped and colored with Copic markers. I distressed the cardstock with Tim Holtz Frayed Burlap distress ink. A touch of faux stitching and photo corners framed my card. I popped Happy Holidays framed with one of the Card Labels up on foam tape and added a bit of red satin ribbon. 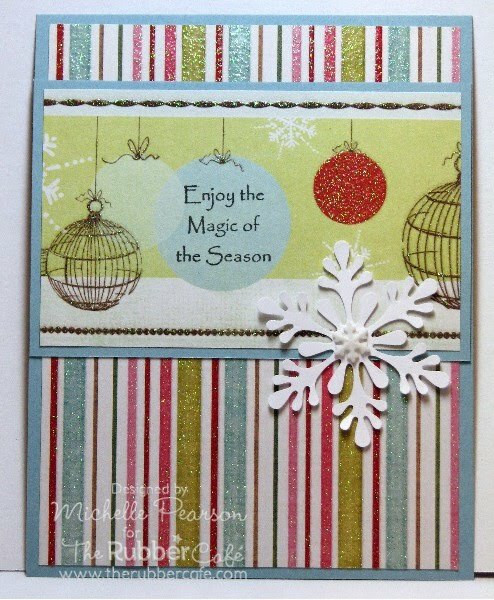 A simple, quick, yet striking holiday card! I have been on a CAS kick using the new set Christmas Tidings from The Rubber Cafe. These are great cards to mass produce and they are really elegant. Both cards uses labels nine nesties and were colored with copic markers. Sorry for such a quick post but it is a super nice day here on Long Island and I am off to go enjoy it!! !Enjoy YOUR day!!!! It's almost the weekend...hope you had a great week so far! Today I wanted to share a couple of cards that I made using the "Give Thanks" sentiment. This one is pretty basic so that the focus is on the sentiment. 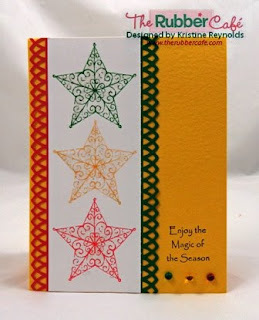 The patterned paper is from my DCWV Indian Summer pack. I also used "Card Labels" for this card. In addition to "Give Thanks" I used "Gourds" this card. I love the fall season and these cards really put me in the mood! I hope they help put you in the fall mood too! I've had paper embroidery on my brain of late, so I chose the double star pattern from my Design Originals Embroidery on Paper book. I used two strands of DMC gold metallic thread to stitch my star. 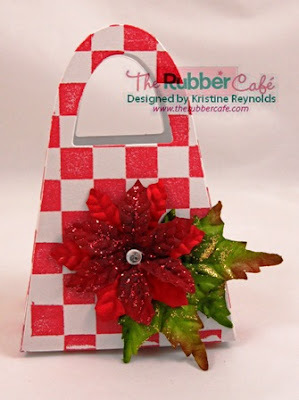 I embossed the fabulous star from The Rubber Cafe's Ornamental Holiday set. The addition of the gems really makes the card pop! Made this little guy today to share with you all. I got the idea from a class I took recently and LOVED the idea. It's a card/hot chocolate holder. On my version I used stamps from the Warm Wishes set, stamped with blue ink and embossed with clear embossing powder. The middle image has been popped up with foam. Pull the ribbon and voila hot chocolate. Today I have a fun little set to share. 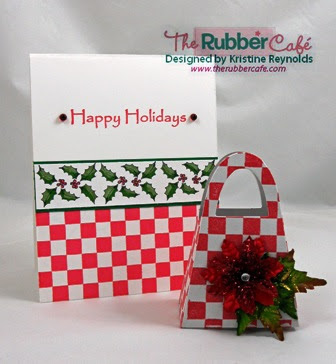 I used "Christmas Tidings" and "Background Basics" from The Rubber Cafe to create this gift set. The Mini Purse Bag is by Creative Cuts and More. I covered it and the bottom of the coordinating card with one of the stamps from "Background Basics" using red ink and then attached the Prima flower with a silver brad. I colored the card with copic markers and used Holly Berry Jelly dots on each end of the sentiment. I love those jelly dots!!! Here's a close up of the card. It's never too soon to get started on your holiday projects. I hope I've given you some inspiration to get started! Have a great day! Hi folks! Have you started making the Christmas cards yet? I have, but I know I’ll end up like every year in the past – with not enough time to make the cards I had planned. The rescue for me is usually to make sets of real clean and simple cards done in 10 minutes. Like the ones I did for today. 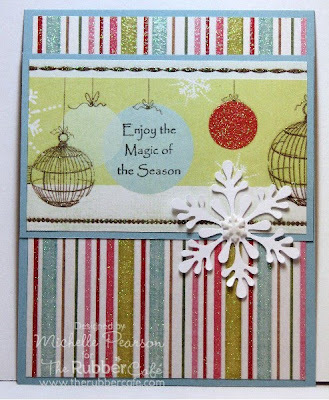 I used some smooth vanilla colored cardstock, the beautiful Christmas Tidings stamp set and some scrap papers. This one took 7 minutes – I clocked it… (yeah I know, I’m a total nerd!). Two stamps and some coloring with copics. Done. Three done, loads to go… LOL! Have a fab new week!